This is an example of a high-end home cinema package which can be customised with different screen, speakers (including wall mountable) and other options. Please contact us to discuss. Earn 19456 loyalty points when you order this item. 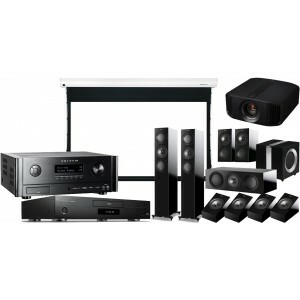 Matched by our hi-fi and home cinema experts, this package includes the JVC DLA-N7 DLA projector, Grandview Tab Tensioned 120" 9ft screen, Anthem MRX 1120 AV receiver, KEF R5 5.1 speaker package along with the Panasonic DP UB9000 Blu-ray player. To discuss your options, including different size/type screens, speaker options and more, please contact us for pricing and installation options.